As a service to our area nonprofit organizations and fundraising professionals seeking new opportunities, our Chapter offers a job posting service. Only positions that have significant fundraising responsibilities are announced through our service. If your organization is seeking to fill a fundraising position, please submit a PDF version of the job announcement. We ask that you include your organization logo at the top and a brief intro paragraph about your organization, your mission, etc., with the job announcement to follow. Please be sure to include how someone should apply. The announcement will be sent to our e-distribution list and posted on the page below. If your organization is interested in posting a position, please contact our Chapter Administrator, Sherry Griffin Grundy at afpsierrachapter@gmail.com. 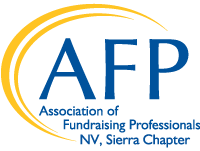 Job postings are $75 for AFP Sierra Chapter members and non-members pay a $125 posting fee. Please contact our Chapter Administrator first, before paying, by sending the PDF of the announcement so it can be reviewed.